A truck as unique as the 1794 Edition deserves to roll on a set of wheels that are just as distinct. These 20-in. chrome-clad alloy wheels are available exclusively on 1794 Edition and will command the road, no matter where you’re headed. 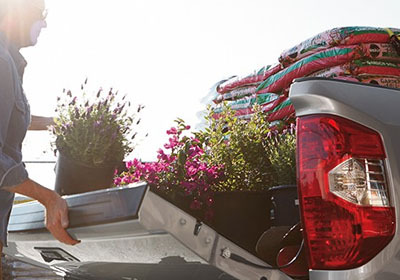 The easy lower and lift tailgate opens and closes with just two fingers, plus it’s easily removed and can be locked to secure cargo concealed under a tonneau cover or shell. Sometimes you just want to carry a little more stuff, or shield something from the elements. 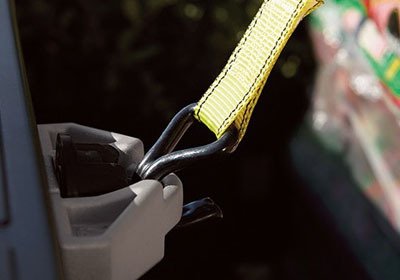 With seats that fold up instead of down, Tundra makes it easier to get in and out, and load your gear. This makes having a hobby, a family, or a dog, a little easier. Job sites are rarely on a map, but with Tundra’s available Integrated Navigation featuring a 7-in. high-resolution touch-screen display, you’ll find your way, no problem. Nothing makes a long drive a little easier than some tunes, and nothing makes backing up a trailer a little easier than the wide-angle backup camera. 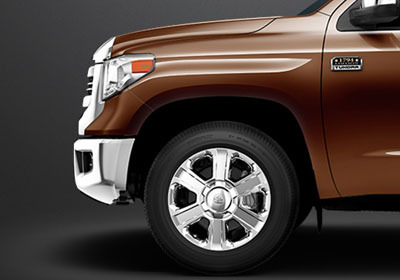 25 Both are standard on Tundra, to make your drive and workday a little bit easier. As the first full-size pickup to offer Blind Spot Monitor (BSM) and Rear Cross-Traffic Alert (RCTA), Tundra continues to redefine the segment. When the available Blind Spot Monitor (BSM) detects a vehicle, it illuminates a warning indicator on the appropriate outside mirror to alert you to the presence of another vehicle, helping you to determine when it's safe to change lanes.